Introduction to Edible Plants of the Northeast — Learn. Survive. Thrive. This is the second part in a 5 part series covering edible plants found in the United States. This part of the series will cover Northeastern states, including Maine, New Hampshire, Vermont, Massachusetts, Rhode Island, Connecticut, New York, New Jersey, and Pennsylvania. There are plants that grow even in the winter that you could scavenge for food. (Taraxacum officinale): The dandelion can be found all over the world. It’s considered a type of weed, but when I lived up north, I thought they looked pretty in the grass. While most people try to kill the dandelions that have invaded their lawn, you should try to preserve them. They’re mostly abundant in the spring, but can come back around in the fall too. The dandelion is rich in many vitamins and minerals such as, A, B, C, and D, and iron, potassium, and zinc. They’re also low in calories and high in calcium. Dandelions can help treat liver problems, diabetes, urinary disorders, acne, jaundice, skin care and anemia. Since dandelions are enriched in calcium, it can also help promote bone health. You can eat these raw, engrained with a salad, or sauté them in some oil. Since the whole thing is edible, you can cut it up and incorporate it into pretty much anything. The best thing to pair dandelions with is bacon, goat cheese, nuts and lemon. Dandelions have been described as having an earthly, nutty taste, with a slight bitterness to them. You can also make a tea out of the dandelion blossom, by boiling the root, and then straining the liquid. No matter if you cook, eat it raw, or boil the dandelion, you won’t lose any health benefits. Even though dandelions are considered safe, people that are allergic to ragweed, chrysanthemums, marigold, chamomile, yarrow, daisies, or iodine, should avoid the dandelion. You will find dandelions usually in meadows, or even in your own backyard. (Fallopia japonica/ Poygonum cuspidatum): Based on the name of this plant, you would think you would only find it in Japan. Fortunately for us, that’s not true. The japanese bamboo, which is what it’s most often called because of its similarity to bamboo, is tall, grows to about 6’-8’, has wide leaves and their length is twice their width, which is quite different than regular bamboo. The most edible part of this plant is the shoots when they are at least 6-8” tall. Japanese Knotweed is best in the spring, before it begins to turn woody. Since this plant has very high levels of resveratrol, it has been a huge success in alternative and holistic medicine. If you’re not familiar with resveratrol, it’s a powerful antioxidant that helps plants such as the japanese knotweed, protect itself from environmental stresses. It’s also found in the skin of grapes, peanuts and blueberries, but japanese knotweed has the most resveratrol content, excluding wine. Since japanese knotweed has a high level of resveratrol, the health benefits are nothing more than amazing. For one, it helps with many cognitive disorders such as, Alzheimer’s disease and dementia. Resveratrol also seems to help with neurodegenerative processes that effect neural pathways. 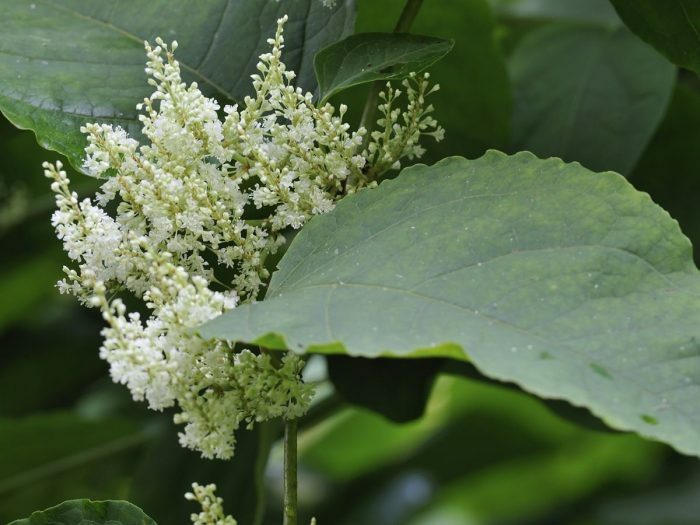 Japanese knotweed can prevent or counteract heart disease. It has shown that if resveratrol is added to your daily food intake, even for someone who is eating a rich and high- fat diet, heart disease can be prevented. Blood pressure can be lowered, or regulated with resveratrol, as well. If you’re having stomach issues such as, bloating, cramping, and constipation, then eating japanese knotweed will help ease stomach problems, and since it acts as a mild laxative, it will help keep your intestines clean, and clear out any distress you may be having. Resveratrol can also prevent insulin resistance, and keep your blood levels regulated. Not only is it enriched in resveratrol, it has vitamins A and C, as well as potassium, phosphorus, zinc, and manganese. By far, I would say this plant has the most beneficial nutritional effects on the body out of all the plants I’ve researched so far. You can eat this plant raw, since it has a tart flavor to it, but if you can, you will want to cook it. You can boil or steam this plant, or eat it raw with a dip. Either way, it will be delicious and nutritious. 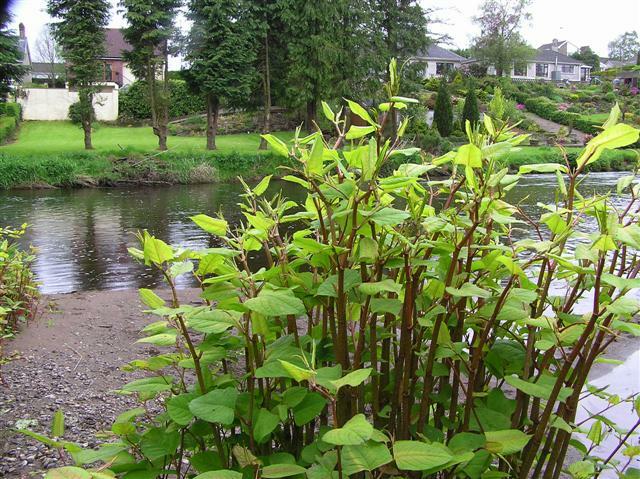 Japanese knotweed grows in riverbanks, riversides, and basically where nothing else can grow. 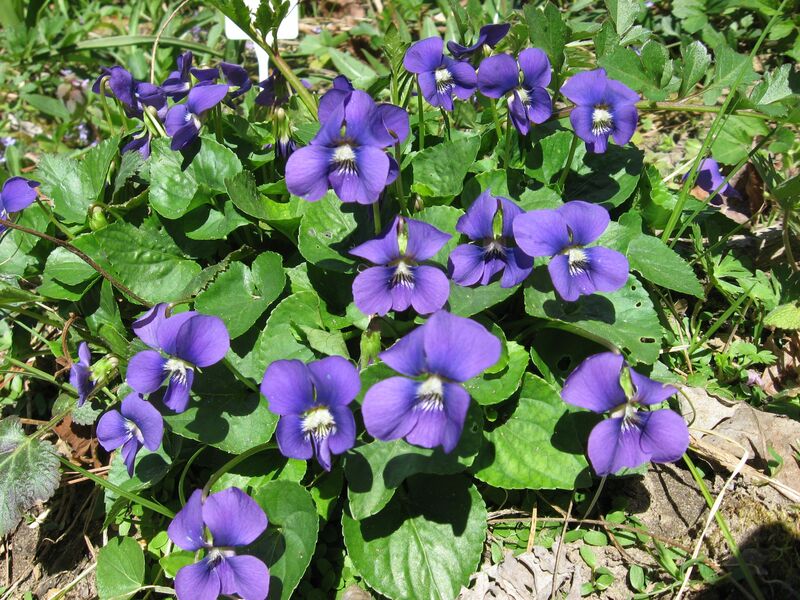 (Viola sororia): These beautiful flowers are considered weeds. Their colors can vary anywhere from purple to white to blue. Like any other flowers, violets are found in the spring. Normally, they’re scattered throughout the yard, unlike other flowers, which are found in the dense woods. These flowers have five petals, two on the sides, and one at the center bottom. The bottom petal is usually discolored, or a different shape than the other four. Violets are bitter, sweet, cool, moist, and a little overpowering. Violets have been used for many ailments such as, acne, asthma, bronchitis, colds, eczema, fever, headache, sore throat, ulcers, urinary tract infection, varicose veins, whooping cough, and even anger. They contain beta-carotene, vitamin C, salicylates, mucilage, rutin, and essential oil. The great thing about violets is that you can use them for so many things. For example, you can eat them raw; mix them in salads, or use as a potherb to give food some flavor. You can make violet tea, which is made mostly from the leaves. The tea can be a substitute for baby aspirin, and is safe and gentle. The leaves can be used as a lettuce substitute, and is possibly more nutritious. You can find violets anywhere. They grow in a lot of home gardens and lawns, but you can find them in meadows, fields, near riverbanks, along the road, and near the woods. 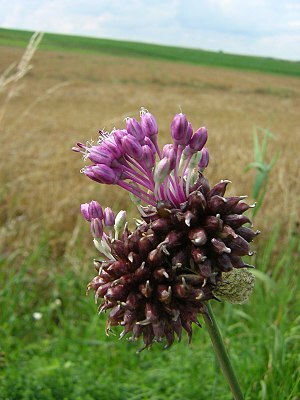 (Allium vineale): This plant doesn’t just grow in the northeast, but all over the world. It’s also called crow garlic, and even though similar, it isn’t related to the domestic garlic that many of us use in our household kitchen every day. The wild garlic plant resembles grass, and sometimes makes it difficult to tell the difference; especially in high field grass. Wild garlic can grow in many different types of environments; anywhere from wet or dry soil, sandy or gravelly soils. The basil leaves start to come out in early spring; the flowers come out from May to June, and then die, which leaves the stems through summer and fall. The whole plant is edible, and is good for many different uses. It can be confused with the other two onion plants: wild and nodding onion, which are both edible. 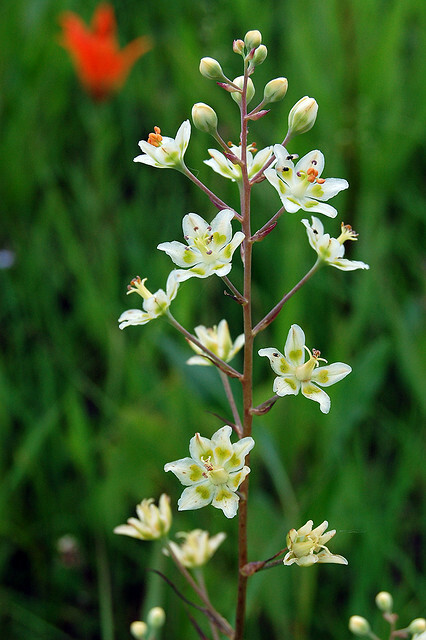 The death camas and star of bethleham plants will be discussed a little later. Those are deadly and should be avoided. Just like domestic garlic, wild garlic helps regulate cholesterol, and treats high blood pressure. Wild garlic treats urinary tract infections, and provides good flora bacteria to the intestines since it has anti-fungal and anti-bacterial properties to it. It also improves kidney function, the leaves can be broken down to provide relief to knee pain, and the seeds can help with nausea and vomiting. If you’re using them to cook, try to add them towards the end so that the freshness lasts. Wild garlic can also be added to salads to add some flavor. You can also eat it raw, so bon appetite! You can find wild garlic in grain fields, meadows, pastures, lawns, gardens, roads, rivers and streams. Death Camas (Toxicoscordion venenosum): The death camas is highly poisonous and as you can tell, resembles the wild garlic. It has the toxic chemical called zygacine, and doesn’t just affect the bulb, but the whole plant. What makes it even worse is that they all have bulbs. The death camas won’t have the garlic smell that the wild garlic has. Once you cut the plant, if it doesn’t have the scent of garlic then throw it out. IF IT HAS NO SMELL, IT’S NOT WILD GARLIC! Slowed heart rate, diarrhea, nausea, abdominal pain, dizziness, headache, reduced blood pressure, respiratory depression, muscle twitching, muscle spasticity, ataxia, hyperactive deep tendon reflexes, and coma. It doesn’t take long to feel the effects of the plant, and if help isn’t available, it will be fatal. Even if you do make to the hospital in time, it doesn’t mean they can reverse the effects either. 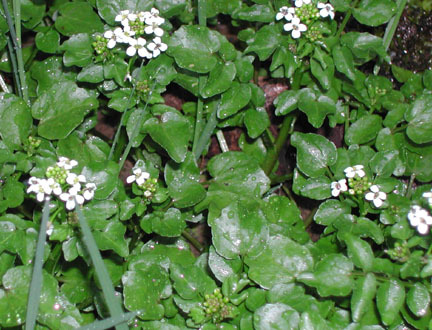 (Cardamine pensylvanica): Even though the name might scare you, bittercress isn’t bitter. Bittercress is a weed found in early spring and late in the fall. This plant has identifying marks that will make it easier to spot. For one, the bittercress has circular to three-lobbed small leaves near the base of the plant, which are arranged neatly along the stem. The clusters of flowers are small and white, which turn into seed pods later on. Bittercress contains glucosinolates which help remove carcinogens from the body. It also has vitamin C, beta-carotene, and lutein, which helps keep eyes healthy. You can eat the leaves and flower stalks raw, or you can cook them. Add them to any dish to get it a bit more flavor, and a little spice. Bittercress can be found on most lawns in the northeast. Well, that’s it for the northeast. There’s plenty more out there to explore, but remember to be careful and to not eat anything unless you know exactly what it is! Stay tuned for the next part in this series- the midwest.